It’s no secret that I’m a big fan of yoghurt. Lidl sells thick Greek yoghurt by the 1kg bucket (literally – the pot has a handle), and I’ve been known to devour one in an embarrassingly short amount of time. Part of yoghurt’s appeal for me is in its versatility – it is equally at home in both sweet and savoury dishes. If I’m going for sweet, my yoghurt toppings often extend to honey (or if I’m feeling extravagant, date syrup) and some sort of nut, usually flaked almonds. Recently, I’ve started experimenting with using yoghurt in more savoury dishes as a topping or sauce, often combined with herbs. This recipe is a shameless knock-off of a meal my friend Heather cooked for me. The earthy root veg, roasted with honey, cumin and fiery harissa, is topped with a thick sauce of natural yoghurt, tahini and parsley. I use flat leaf parsley here, as I have no patience with the curly stuff. The herby yoghurt elevates this dish beyond humble roast veg, giving it a freshness that compliments the spice really well. It’s so good that you’ll be buying yoghurt by the bucketful in no time…. Paris and I spend most of the week engaged in an intense back and forth about what we’re going to blog about at the weekend. We send each other links to blogs that might have a particularly well-arranged salad, or suggest a novel way of using chickpeas. We bandy around ideas of ingredient and flavour combinations, some of which we instantly dismiss as being too bizarre. In this case, we had gone through so many possible ideas for dishes involving preserved lemons, that by the weekend we had completely forgotten what we decided on. 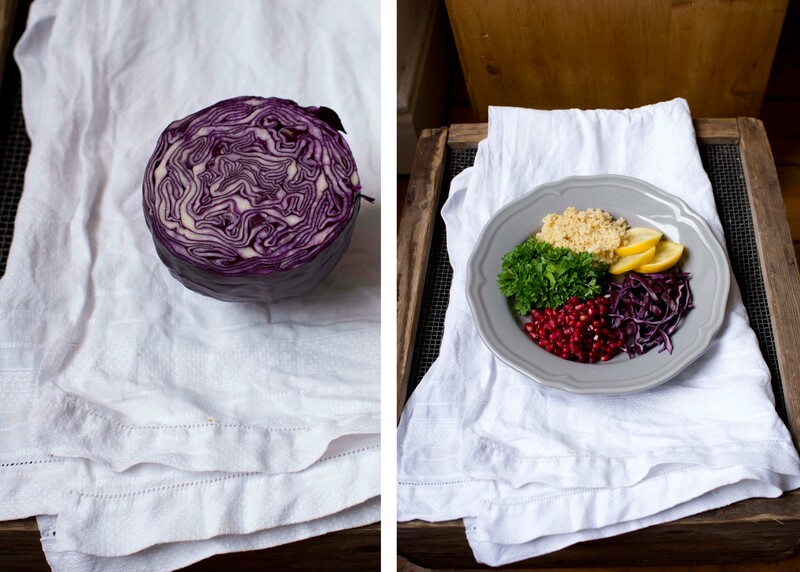 So this was a more spontaneous creation, centred around the notion that there had been a lot of talk throughout the week about red cabbage. 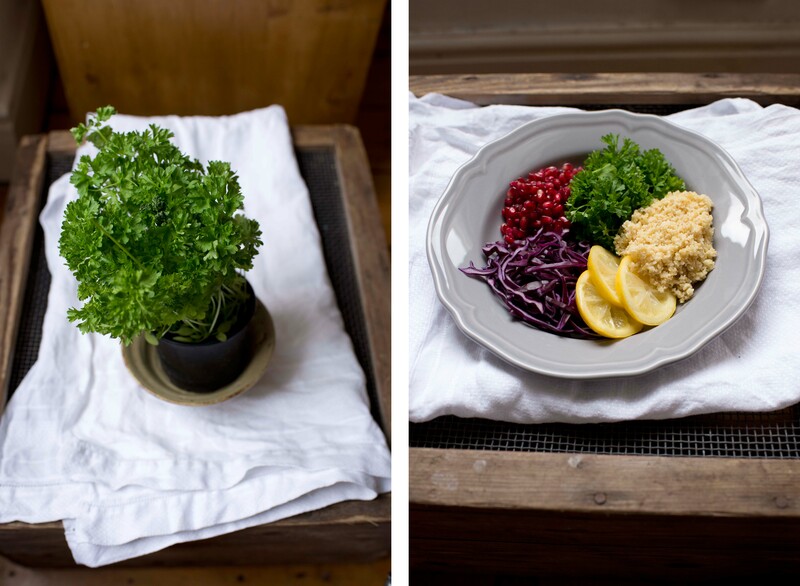 The ingredients in this salad were chosen primarily for their visual appeal, based on how well they would compliment the bright yellow of the preserved lemons. I know, right. Hipster food bloggers. Not to mention the poncey addition of pomegranate seeds. To be frank, I don’t actually enjoy eating pomegranate seeds that much – I find that hard bit in the middle somewhat irritating. But they look so beautiful, that for the sake of the photographs I conceded. 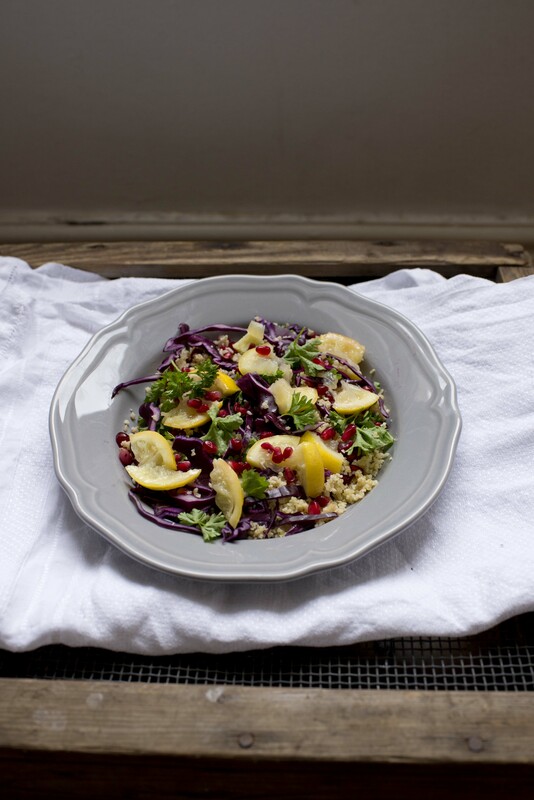 We decided to pair the lemons with red cabbage (yellow + purple = good), then added vibrant green parsley leaves and red pomegranate seeds. When our eyes began to hurt, we chucked in some bulgur wheat to calm everything down a bit. Bulgur wheat is my new favourite grain. It has the easy pour-a- kettle-of-water-over-it cooking method shared by cous-cous (and pot noodles, although I’ll pretend I don’t know that, as it wouldn’t do much for my food blogger image). It retains a pleasant bite and has a slight nutty taste. It balances out the sharp acidity of the lemons rather well. 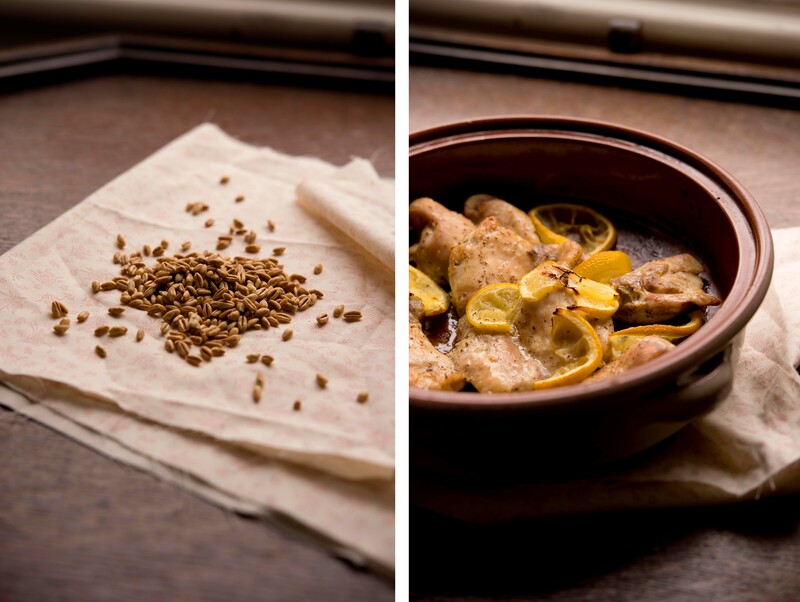 Preserved lemons are usually the preserve (pun entirely intended) of hearty Moroccan lamb tagines and baked fish dishes. 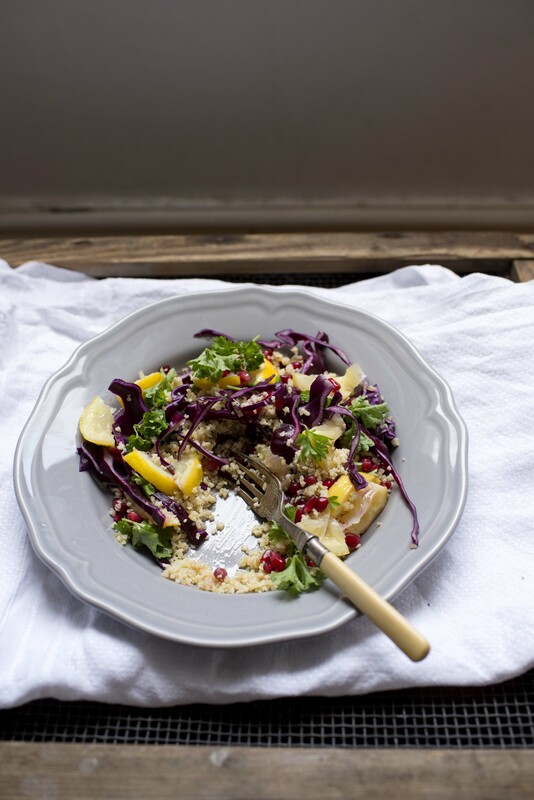 Here we’ve given them a new lease of life as the centerpiece of this simple salad. Food is my main motivator for travel. That, and taking photos: of the scenery as well as the food. The thing that excited me most about my trip to South-East Asia and Australia last year was the different tastes that awaited me in the five countries. From paad thai on the streets of Bangkok via smoked duck in Singapore to kangaroo in Adelaide, South Australia, it was a pretty epic range of tastes. One of my favourite destinations in terms of food has to be Italy. Italian food is so much more than just pizza and pasta – although the pizza and pasta are, usually, excellent. I first had farro in Florence, in a tiny café nestled somewhere in the city’s ochre-coloured, labyrinthine streets. We took refuge from the baking hot sun in the middle of the day, and had several platefuls of a very memorable salad: farro with cherry tomatoes, basil and mozzarella. When I first tried it, I thought the mysterious grain was simply pearl barley, but that for some reason it tasted so much better than the dowdy English variety. 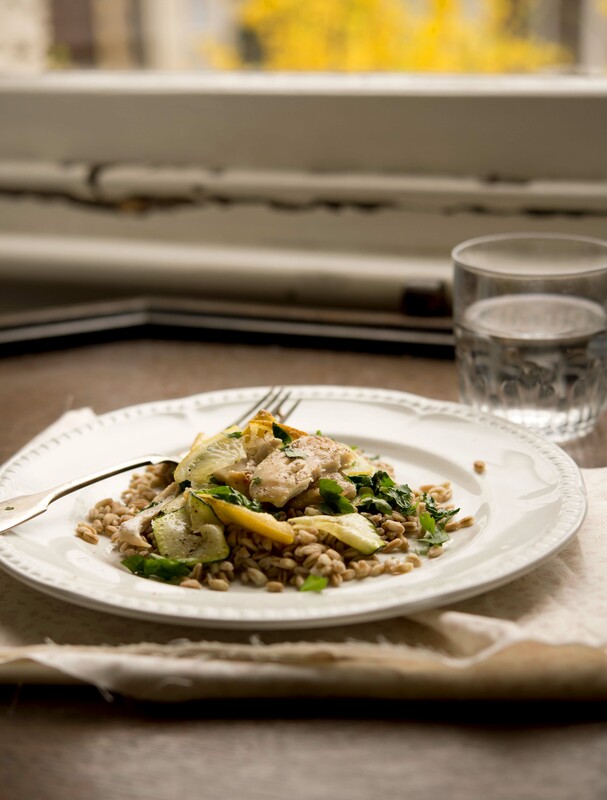 Farro is in fact Italian pearled spelt, very similar to pearl barley but with a nuttier taste which makes it altogether more likeable. It’s great cold, in refreshing salads, or warm, with unctuous layers of tomato sauce poured over it. 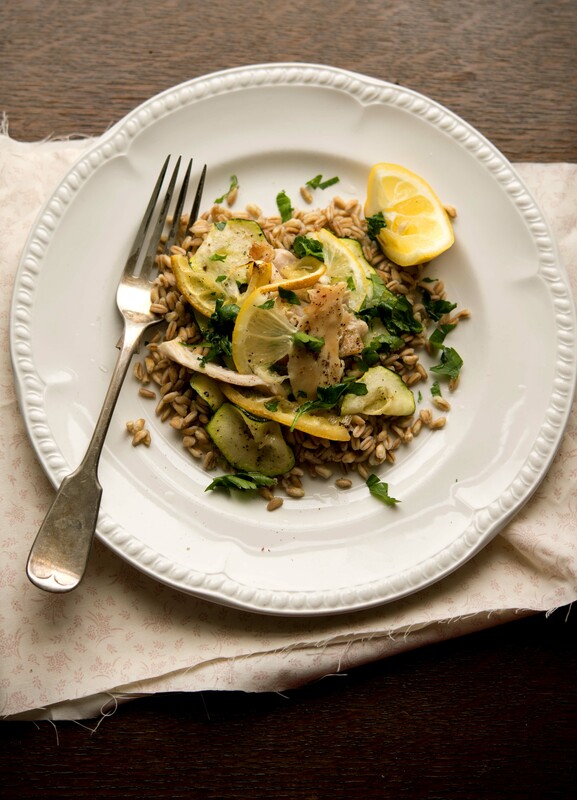 It seems I’m not the only one who is a fan of farro: there was an Ottolenghi recipe in Waitrose Magazine this month for grilled lettuce with farro and lemon. 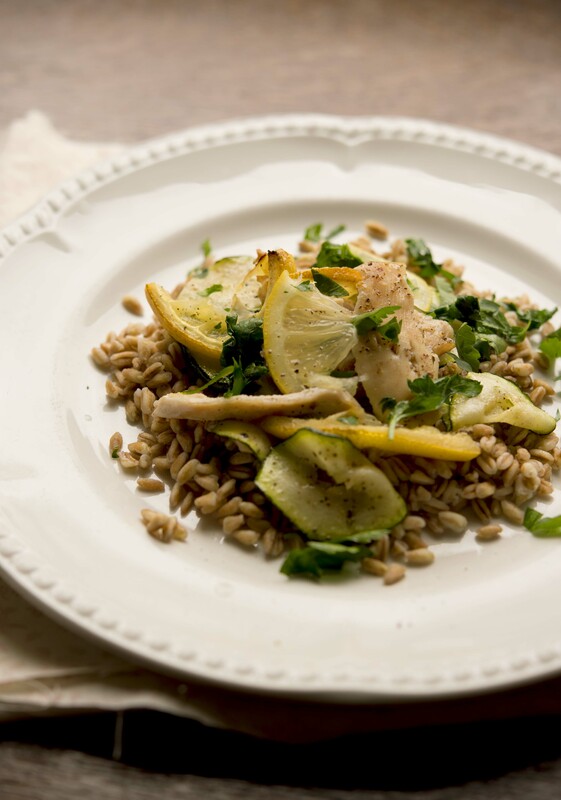 Here, in keeping with Italian simplicity, I decided to combine my new favourite grain with some chicken baked with lemon, and some gently fried courgettes. A spray of roughly chopped parsley and an extra squeeze of lemon finished it off. This dish could work as well warm as cold – more suitable for lunch cold and dinner hot, maybe. But for the purposes of needing good midday light for the photos, I had it warm for lunch, rendering that previous claim somewhat redundant.